A Democratic member of the Federal Communications Commission is being criticized for politicizing hurricane recovery efforts within her agency. Commissioner Jessica Rosenworcel has been vocal in her attacks against the FCC, which is led by Republican chairman Ajit Pai. She claims the agency is not doing enough in the aftermath of Harvey, Irma, and Maria because the FCC has not yet held field hearings on the ground in Puerto Rico, Texas, and Florida. However, Pai has traveled to Texas and Florida, where another Democratic FCC commissioner joined him, Mignon Clyburn. Rosenworcel has taken to Twitter to make her complaints. "After Hurricane Katrina and Hurricane Sandy @FCC held hearings to address network recovery," she tweeted earlier this week. "Why won't agency do it for Harvey, Irma & Maria?" The FCC did hold field hearings after Katrina and Sandy, but not until months later. In the aftermath of Hurricane Sandy, the FCC did not announce it would hold field hearings until Nov. 21, nearly a month after the hurricane made landfall. A field hearing was not actually held until February 2013, four months after the storm. Following Hurricane Katrina, the FCC held a field hearing a little over two weeks after the storm made landfall, but not in New Orleans. The hearing was held in Atlanta. 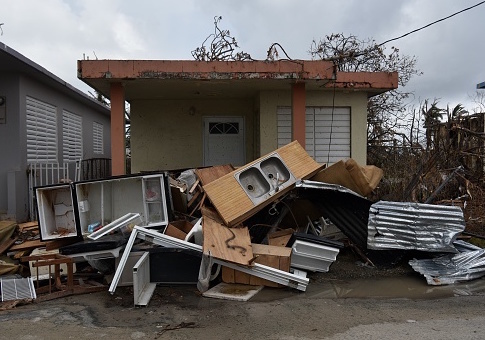 Hitting Puerto Rico with winds of 155 miles per hour, Hurricane Maria has led to massive devastation, as nearly the entire island was left without power, and 90 percent of its cell towers knocked out. "For some, politicizing the hurricanes might be expedient. But it's distasteful and remarkably tone deaf," an FCC source told the Washington Free Beacon. "There is an active relief and recovery effort underway, and a field hearing at this time would serve as a major distraction." In Florida, Pai and Clyburn met with people involved in recovery operations and received updates about the ongoing efforts to restore communications services. Pai said the FCC is already learning lessons from Harvey and Irma, without a field hearing. He is now advocating for more fiber optic cable service after visiting Houston, because they are "impervious to water and have a greater capacity to handle surges in 911 calls." In a statement providing updates on its response, Pai said the FCC is actively working with FEMA and national cell service carriers in Puerto Rico to restore communications on the island. "Over the weekend, I spoke with most of the CEOs or representatives of the largest national carriers serving Puerto Rico, as well as Open Mobile, a provider of wireless services in Puerto Rico, and Claro (or the Puerto Rico Telephone Company)," he said. "In those conversations, I made clear that the FCC stands ready to do whatever we can to assist these companies in restoring communications throughout the island." "We've gotten some results already; for example, we helped ensure that much-needed generators and critical equipment made their way to Open Mobile, the Puerto Rico Telephone Company, and other communications providers," Pai said. A spokesperson for Rosenworcel pointed to her statement calling for hearings "as soon as feasible." Rosenworcel has repeatedly called for hearings on Twitter and said she hopes the FCC has the "guts" to help Americans in Puerto Rico impacted by Maria. "I believe you don't pull together a report with only the information you amass from sitting in front of your keyboard," Rosenworcel said. "You get out. I think the Commission should demonstrate its commitment to the first sentence in the Communications Act—which seeks to focus our energies on public safety—and demonstrate we know how to make those words ring true." "Here's how: This agency should hold hearings in Texas, Florida, and Puerto Rico—where we are in the midst of a humanitarian crisis impacting more than 3 million American citizens—as soon as feasible," she continued. "There is ample precedent for this approach—it was used in the aftermath of Hurricane Sandy and Hurricane Katrina. I know from my experience you learn more out on the ground than you do sitting on this dais. I hope this agency has the guts to do this. I, for one, look forward to traveling with my colleagues—and making this happen." Other tech and telecom experts pushed back against Rosenworcel on Twitter, arguing emergency response to get cell service back up is more important than "bureaucratic" hearings. This entry was posted in Issues and tagged FCC, Hurricane Harvey, Hurricane Irma, Puerto Rico. Bookmark the permalink.